Stravinsky's score for the ballet Petrushka, commissioned by Diaghilev for the Ballets Russes, was first performed in Paris in 1911 and was an immediate sensation with the public and the critics. It followed by a year the great success of his score for The Firebird, also produced by the Ballets Russes, and it confirmed Stravinsky's reputation as the most gifted of the younger generation of Russian composers. The ballet had begun in Stravinsky's mind as a "picture of a puppet suddenly endowed with life, exasperating the patience of the orchestra with diabolical cascades of arpeggios." Soon Diaghilev had convinced the young composer to turn the work into a ballet score. Benois was chosen to be his collaborator in the libretto, Fokine and Nijinsky became involved, and the bizarre tale of three dancing puppets -- Petrushka (a folk character in Russian lore), the Ballerina, and the Moor, brought to life in a tragic tale of love -- would soon become one of the most acclaimed and performed of ballet masterpieces. 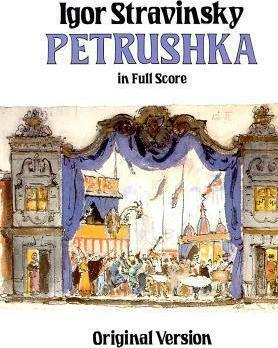 Brilliantly orchestrated, filled with Russian folksong as well as new and striking harmonies, alternately poignant and splendidly imposing, the score of Petrushka continues to be a popular subject for the study of tonal language and orchestration. This edition is an unabridged republication of the original edition published in 1912 by Edition Russe de Musique in Berlin. Printed on fine paper, sturdily bound, yet remarkably inexpensive, it offers musical scholars, musical performers, and music lovers a lifetime of pleasurable study and enjoyment of one of the most popular and acclaimed musical works of the twentieth century.